Round six is officially behind us, but it leaves us with a serious contender and a new high score, at least for now. 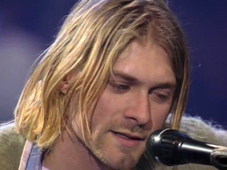 Once again, a Nirvana acoustic cover proved popular with the voting public, as The Man Who Sold the World racked up an intimidating 7.55 average. In addition, it made the Wall of 10s thanks to votes from Aiko and G. It was joined on the wall by GNR’s epic version of Knockin’ On Heaven’s Door, which, despite the ten-love from Aiko and Chris Roomba, barely squeezed past I Don’t Believe You. In this rare photo of David Bowie, we see that Kurt Cobain not only covered Bowie's music, but also covered his hair. In this round’s Beatles match-up, The Two Of Us sends Don’t Let Me Down on its way back home 146.6 to 114.9. In the battle of the Band covers, The Weight sinks Broken Arrow 137.2 to 108.1. In the duel of the Dylan tributes, Knockin’ On Heaven’s Door just barely survives a strong push from I Don’t Believe You 142.19 to 137. Finally, in the bout between Bowie covers, The Man Who Sold the World stamps out Life on Mars 158.5 to 120.9.